« Only two days left! A Big Christmas Kindle Book Discount as My Gift to You! “I’m so glad we gave up smoking when we were young,” I say as we bump along our worsening track to the main road. “I didn’t need it, I was addicted to you!” My man grins as he tries to pull his gloves on, whilst negotiating the potholes. Now he does say the nicest things sometimes, but I am gripping my seat at that moment as he swerves around one-handed, due to the glove thing. “I guess you had a different highway code to me.” I muse. “Your’s must have read ‘mirror, signal, manoeuvre, gloves.” He grins cheekily again as he finally gets both gloved hands back on the wheel! Well, I have to say that last week started rather well as Monday was the opening party night for ‘La Bottega Del Buon Caffe’ in Florence, and we had invites. It is Borgo San Pietro’s new restaurant in the city and it is very chic indeed. 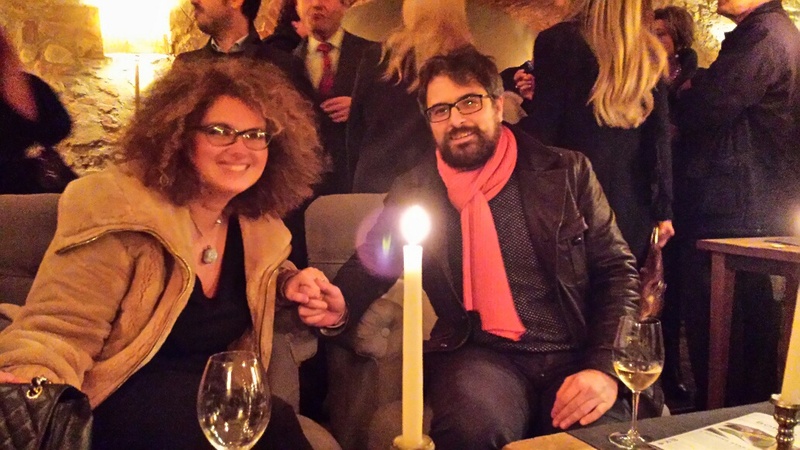 We were plied with champagne, wine and nibbles and met some really interesting people. http://www.labottegadelbuoncaffe.com We were lucky to grab two comfy armchairs with a vantage point and were joined by new friends Anna and Cristiano. Anna is Editor in Chief of a newspaper called ‘Florence is You’ http://www.florenceisyou.com and we had a really enjoyable hour or so in their company. We are going to meet them for lunch before Christmas, which is great. I’ll let you know all about it. http://www.ristorante-ceraunavolta.com Paolo produces good Tuscan cooking without all the frills. Gianluca, the cheeky waiter, was away in Israel on holiday. These Italians do get around. My man’s reaction to his vegi sausage and mash! However, for a real treat, we returned to Ristorante Latini on the Thursday http://www.ristorantelatini.com for lovely cheeses, aubergine parmesan bake, pasta with white truffles and freshly baked almondy cake biscuits, for dipping in the Vinsanto. It’s also a nice comfy hotel, if you need somewhere to stay in the Certaldo/San Gimingiano area. Yes, I do occasionally cook, but as you know my cooking is pretty desperate at the best of times. A couple of weeks ago I cooked vegetarian sausages with mash, wanting to appeal to my man’s Englishness, but unfortunately he hates anything processed and the enclosed photo shows you exactly what he thought of them! The Ant Foundation display in Laura’s Bar. 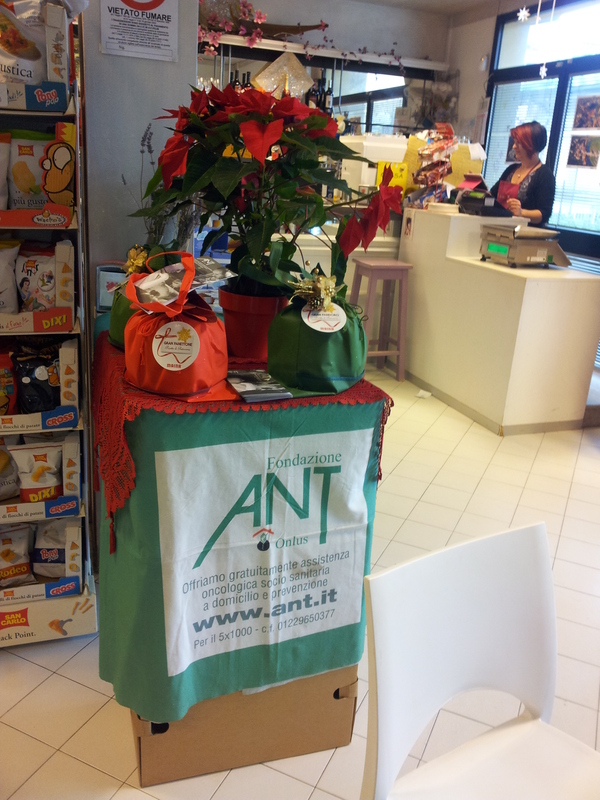 Back at Laura’s bar/alimentare in Fiano, Sig Rotund has put in a display of Panettone (Italian style Christmas cake) and Poinsettia that are for sale in aid of the Ant Foundation http://www.ant.it So, as it is a very good cause, I bought one of the green wrapped panettone, which can be used as a bag afterwards. I’m a sucker for bags. Oh yes, before I go, I must mention a book I have recently read; I really enjoyed it. It’s called ‘Just Vines’ by Diana Strinati Baur. If you love Italy and romance, this one’s for you. I am now reading the genre I like best, that is a thriller, Jake Needham’s latest ‘The Dead American’. I love his stuff. What are you currently reading? Do drop me a line. Well, I’m really sorry to say, I must stop here due to the massive work load to be completed before Christmas. I’m halfway through Diana Baur’s book now. I’m not a romance kind of guy, but I’m quite enjoying. It helps that it’s set not far from here… Next on my list is My Father, the Assassin, now that I’m looking forward to!